This article is about the night elven faction. For the Horde nightborne group, see Highborne (island expedition). For the Quel'dorei from the Eastern Kingdoms, see high elf. The Highborne (or quel'dorei, meaning "children of noble birth" in Darnassian), were the upper class and a sect of the ancient night elf civilization composed of the favored servitors of Queen Azshara. The Highborne were largely responsible for the War of the Ancients, and most of those Highborne who had allied with the demons and survived the war were turned into satyrs or naga. Those that allied with the Kaldorei Resistance before the last battle of the war found themselves exiled from Kalimdor, and eventually became the high elves of the Eastern Kingdoms. Although to this day there are surviving Highborne, they are not treated as nobility by modern night elf society, and in practical terms the caste ceased to exist over ten millennia ago. One notable exception are the Shen'dralar, a holdout group against the Burning Legion during the War of the Ancients. They were able to defend Eldre'Thalas (now known as Dire Maul) but in doing so became isolated from the rest of night elven society throughout the Long Vigil. However, after the Cataclysm, the Shen'dralar under leadership of archmage Mordent Evenshade negotiated successfully to rejoin their kaldorei brethren in Teldrassil. According to Brann Bronzebeard, there is little physical difference between the Highborne and the rest of the kaldorei (save perhaps the Highborne being slightly pastier), but they consider themselves different enough. Remains of the ancient Highborne. The Highborne were the upper classes of the ancient kaldorei civilization, at first a nameless caste made up of night elves who had unusual intelligence, strength, skills, or wealth and thus found favor with the ruling monarch. Their vast arrogance and greed, garish and multicolored clothing, and decadent habits did not endear them to other night elves. In fact, these powerful families became convinced that they were superior to the rest of their race, and so they began to call themselves the Highborne. As a member of the same caste, the queen Azshara approved of the term and made it official. Plumbing the depths of the great Well of Eternity for knowledge they discovered primitive magic; and as time passed, they distanced themselves from the lower castes and began using their rank to selfishly guard their magical power, restricting access to the magical Well of Eternity to only themselves. The access of arcane magic to the ruling caste began to split the kaldorei was hereditary; families that belonged to the highest caste frequently arranged marriages so as to maximize the magical ability of their offspring. This selective breeding, combined with frequent access to the Well of Eternity, resulted in night elves with progressively stronger magical abilities and greater understanding of how to use those skills. A kaldorei without Highborne blood — such as Illidan Stormrage — could master arcane power if he so wished (and had access to it). In fact, the mastering of the arcane arts was common among the populace, resulting in organizations such as the Moon Guard, the official military sorcerers. At some point, the Highborne fought in the Battle of Suramar Pass and lost. Over time, the ever-more reckless use of magic by the Highborne and their queen led to their slow corruption and addiction to the power it granted, and the ripples sent into the Twisting Nether attracted the dread forces of the Burning Legion to Azeroth. The unlimited magical power offered by the demon lords seduced the queen and many of her servitors, and they agreed to grant the Legion entrance to Azeroth. Finally, giving themselves over to magic’s inevitable corruption, the Highborne fell to darkness and began to worship the Dark Titan, Sargeras, as their god. Some, led by Xavius, gave themselves wholly over to the service of the Legion and were transformed by fel magic into the satyr. To cement their dark pact, the ecstatic Highborne opened a great, swirling portal within the depths of the Well of Eternity which would allow the armies of the Legion access to the world, followed by Sargeras himself. In the cataclysmic war that followed millions died as the demons swarmed over the lands of Kalimdor and laid siege to the lesser night elves’ sleeping cities, leaving only ash and sorrow in their wake. Though the brave kaldorei warriors rallied from the heinous betrayal of their rulers and rushed to defend their ancient homeland, they were forced to give ground, inch by inch, before the fury of the Legion’s onslaught. The Legion was finally foiled by the efforts of the night elf Malfurion Stormrage, who in his battle with Queen Azshara collapsed the Well of Eternity, killing many Highborne and condemning those who survived to the sea floor where they were transformed into the serpentine naga by the mysterious Old Gods. Azshara's followers moments before being drown. Yet many Highborne did not meet their fate at the bottom of the sea. Some had betrayed their queen at the last minute, having realized the horrors she would unleash upon the world. These defectors had fled the capital city of Zin-Azshari, site of the Well, and were thereby spared when the Great Sundering tore Kalimdor apart. Others remained hidden away in far-flung strongholds such as Eldre'Thalas. Those who had joined with the rest of their shattered peoples fled the rising waters of the Great Sea, eventually arriving at the base of Mount Hyjal, where they helped to rebuild the night elven civilization in the newly reshaped world. They were not entirely welcome: the night elves, now led by Malfurion, reviled Queen Azshara's former servants and were doubtful of their loyalty. Still, without the Well to supply their magic, the Highborne were considered little threat, and were permitted to rejoin night elven society. However, many felt the pangs of their magical addiction and were tempted to use the power of a new Well of Eternity created by Illidan Stormrage, who from then on would be termed "the Betrayer" for his terrible crime. Though the use of arcane magic was forbidden on pain of death, the Highborne foolishly attempted to convince the kaldorei race of the power of magic by unleashing a magical storm upon Ashenvale. Their desperate gambit failed, and the Highborne were exiled; the night elves mercifully refusing to execute any more of their brethren. This happened 7,300 years BDP and around that time, the Shen'dralar Highborne led by Prince Tortheldrin began feeding on demonic energies. The new forms of the high elves. These exiled Highborne, now known as the high elves, took their punishment in stride, and led by Dath'Remar Sunstrider ("He who walks the day") set sail across the ocean in hopes of finding a new land to call their own. After a long and perilous journey, the Highborne arrived in the land known today as Lordaeron, and there established their kingdom of Quel'Thalas ("high kingdom" or "high home") and crowned Dath'Remar their king. There, they slowly changed in form, diminishing in size and losing their original purple skin to a pinkish hue. They abandoned the worship of the moon, adopting instead the sun, and became the high elves. From a vial of water from the original Well, they created a new one, the Sunwell, to serve as their source of magic. They remembered the mistakes of the past and used Runestones to shield their use of the arcane from the Burning Legion, taking care to practice the magic granted to them by their Sunwell with more care than their ancestors. Nevertheless, after their homeland of Quel'Thalas — and the source of their power — was destroyed by the undead Scourge, a radical group of high elves embraced their Highborne ancestry and resumed for the third time their reckless use of magic. Kael'thas Sunstrider renamed these people "blood elves", and traveled to Outland with Illidan to find a way to fuel their magical addiction. Those who did not travel with him remained behind and began to rebuild their shattered capital city of Silvermoon. As Quel'Thalas flourished, other Highborne communities across the world struggled to survive. One such community dwelled in the city of Shandaral, a repository of arcane relics and artifacts, which now found itself isolated in Northrend in the wake of the Great Sundering. For centuries these Highborne scoured the surrounding forest of Moonsong for a means to sustain themselves. During this time the Highborne would witness the blue dragonflight using spells to crystallize living things and draw power from them. Recognizing it as means to end their suffering forever the Highborne attempted to interact with the dragons but were met with indifference or hostility. 6,000 years before the opening of the Dark Portal a group of Highborne sorcerers infiltrated the lair of the dragonflight, the Nexus, and succeeding in learning the dragons' techniques. However greed drove them to steal powerful relics stored within the Nexus and they thus triggered the wards in place and ensnared the dragon's ire. When the dragons confronted them in the forest the elves attempted to crystallize part of the area and draw magic from the crystals to fight the dragons off, but the spell was much more powerful than anticipated and transformed the entire region as well as twisting the elves' spirits. Several ghosts of dead Highborne still populate many of the night elven ruins left after the Great Sundering in areas such as Azshara (Highborne Apparition, Highborne Lichling) and Winterspring. Some Highborne still exist in their original forms. One such group, known as the Shen'dralar, live in secrecy within their city of Eldre'Thalas — known as Dire Maul to outsiders. Those Highborne who live elsewhere in the world — such as Archmage Tarsis Kir-Moldir — are few in number; the majority having long since become high elves, blood elves, naga, or satyrs. During Year 25, Dire Maul was raided by the Horde and the majority of the Shen'dralar elves were killed, forcing the survivors out of Dire Maul to the forests of Feralas. Recently, citing "change on the wind" the remaining Highborne have been drawn out of hiding, sending representatives to the Kirin Tor and to Tyrande Whisperwind, to rejoin kaldorei society and the world at large, claiming that there will soon be a time when "the kaldorei require the knowledge and skill" the Highborne have to offer. During the Elemental Unrest world event that heralded the Cataclysm, the major Alliance leaders gathered at Stormwind to discuss the recent changes to the world. Tyrande states that even in Darnassus the night elves have noticed the earth is at odds with something, and that perhaps these troubling events were "what have brought forth the Highborne from Shen'dralar." Mordent Evenshade, current leader of the Highborne. Following the successful negotiations between Mordent Evenshade (likely aided by the research from [Daros' Journal]), and Tyrande Whisperwind and Malfurion Stormrage, the Shen'dralar Highborne have rejoined the night elves and has started to train them back into the way of magic and arcane. The Highborne were given a green, secluded area next to the Temple of the Moon to dwell in. Many of the Highborne have returned and are now residing within most of Alliance cities, mainly Stormwind, Darnassus, Ironforge, the Exodar, and the neutral city of Dalaran. This shows that the Highborne have been recently re-accepted back into the Alliance as many act as trainers for the Alliance, offering their services or giving out quests, though the Highborne refuse to teach non-night elven magi, stating: "My apologies, mage, but the arcane secrets of the Highborne will forever remain secrets to you." The Highborne also state that, "The magic of today pales in comparison to that of millennia past. Still, we Highborne know much of the arcane", possibly implying their strength has waned over the ages. The negotiations with the Kirin Tor have likewise been a success as there are Highborne showing up within Dalaran, and the Highborne have even begun to interact with the worgen, with Mordent Evenshade observed speaking with the Gilnean mage and warlock trainers Myriam Spellwaker and Vitus Darkwalker at the Howling Oak; at the Temple of the Moon, Daros Moonlance can be seen conversing with Archaeology trainer Hammon the Jaded. 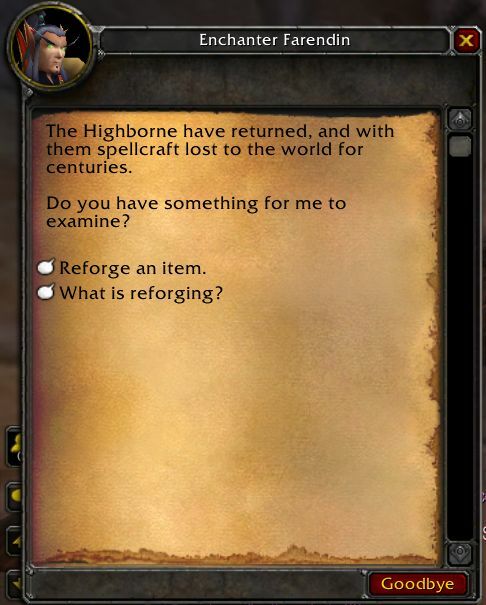 It is also mentioned that the art of arcane reforging, allowing the customizing of armor and weapons, was "originally a magic brought to the citizens of Azeroth by the Highborne", and is among the ancient spellcraft that have returned with the Highborne, though the Highborne themselves for some reason no longer provide such services, instead directing interested persons to the ethereals. However, many night elves still regard the Highborne with wariness and suspicion, as can be evidenced from Sentinel dialogue when asked for Mage Trainer locations in Teldrassil, Rhyanda stating that many still held their order responsible for the actions of the forebears, and Shandris Feathermoon openly declaring that she would have been duty-bound to slay them had it not been for Tyrande's recent mercy. At least one night elven priestess and scholar, Vestia Moonspear, decided to study under the Highborne and become a mage, claiming the chance to learn from them was preferable to "strict ignorance" and in turn teaching other night elves what she learned at the Tower of Estulan, only to be alienated from many of her friends who could not understand her decision. Despite this, the Highborne have continued to provide considerable assistance since to the kaldorei, such as the Highborne mage Estulan informing Silvia of Cho'gall, ogre mage and leader of the Twilight's Hammer, trying to use the Gordok to gain access to the remnants of Eldre'thalas within Dire Maul, and Lorekeeper Amberwind and her apprentices "overseeing the Alliance investigation" of Azshara's ruins in an effort to uncover arcane knowledge amidst the remnants of the night elven empire's capital. Arcanist Delaris aids the Emerald Circle of southern Felwood in battling the Jadefire satyrs and cleansing the area of corruption, noting that the forest's demonic presence could be considered the fault of her kind but seeking to make amends. Further south in Kalimdor, Arcanist Valdurian settles in the Stonetalon Mountains and helps to settle and bind enraged Highborne spirits lingering in the vicinity as well as to gather information for his personal uses before sending adventurers to Lord Fallowmere, while his apparent student Neophyte Starcrest requests the collection of ancient relics in the Ruins of Eldre'thar, a forgotten Highborne city, for study. Groups of night elf magi are also deployed to help stop the ongoing Horde advance in the neighboring Battlescar Valley, albeit with limited success. Because the expulsion of their Highborne ancestors from night elf society after the War of the Ancients was due to their use of arcane magic, the blood elves were outraged to hear that the kaldorei had welcomed the Highborne back and were tolerating the practice of arcane magic again. After witnessing the "rookie" mistakes made by the new kaldorei magi, however, the blood elves are anxiously awaiting whatever mess the kaldorei are going to put themselves in. What's more, some sin'dorei have been able to exploit the kaldorei's inexperience in order to rout Alliance forces, as seen in the "Amberwind's Journal" quest series in Azshara. Andorel Sunsworn finds the idea of night elves trying to reclaim their magical heritage "amusing but for the terrible potential they should discover anything of value here" and states that the night elves lost Azshara ten thousand years ago, also mocking the usage of arcane constructs by the kal'dorei magi as "delightfully inexperienced" and "amateur" before hijacking them and noting that his people, the Highborne of the Eastern Kingdoms, had outlawed them 1,500 years ago. Efforts by the Lorekeepers of Talrendis Point to summon backup from Darnassus are likewise sabotaged by Sunsworn, who derided their use of "laughably primitive magics" and compromised the kaldorei's summoning stone to instead teleport "a crack team of commandos" behind Alliance lines. Despite the apparent inexperience of at least the new kaldorei magi, however, reactions from other blood elves in Azshara are more ambiguous, with Malynea Skyreaver scorning the idea that the night elves could achieve any competence in scouting out magical sites and experimenting with the arcane arts, but nevertheless expressing some degree of concern at the Highborne's unexpected return. In the forest near Darnassus, Archdruid Malfurion Stormrage forcibly intercedes and stops a group of twenty assembled Highborne mages who, without the knowledge or consent of Mordent Evenshade, are attempting to perform a collective spell to test their powers, asserting that such actions went against everything they had agreed upon, despite Var'dyn Skyseeker's arguing that the Highborne's powers would "stagnate" if not used in a sufficient manner and that Malfurion himself had promised that the Highborne would rejoin night elf society while maintaining their own identities, yet instead they were ostracized still. Malfurion responds that there is every intention of their rejoining the kal'dorei, but Var'dyn's teacher Mordent understood that such things could not occur overnight and would play out over time, and tells Var'dyn to have patience. When a murdered Highborne, Thera'brin, is discovered on the outskirts of Darnassus, Malfurion and Tyrande move to stop further bloodshed and unrest by appointing one of the night elves' most cunning and skilled agents to find the killer: the renowned warden Maiev Shadowsong. According to Mordent Evenshade, due to the profound changes Azeroth had gone through, what the Highborne did over the millennia no longer applied, and they rejoined the night elves in desperation due to their faltering ranks failing to replenish and their severe lack of children being born over the last generation. While many of the Highborne seem to retain an air of superiority and some sense of arrogance, viewing most of the non-magi night elven population with contempt (though even Var'dyn respected those wielding immense power, such as Malfurion and Tyrande), Archmage Mordent Evenshade refuses to betray Malfurion and Tyrande and vows to honor his word even as the Archdruid and High Priestess honored theirs. However, as their casualties mysteriously mount, Mordent Evenshade and the remaining Highborne are captured and entrapped by Maiev, who reveal that it was she who had been assassinating their kin; when Var'dyn attempts to use his potent Highborne magic against the Watcher, he is quickly killed by Maiev's bonds. Maiev believed that Darnassus had betrayed her, and deemed Malfurion guilty of the same arrogance that consumed his twin, Illidan, by believing that he knew what was best for the night elf people. In addition, she felt Malfurion had condemned their people by not having Teldrassil properly blessed, thus denying them their immortality, and further despised him for forgiving the Highborne and bringing their "evil" back into night elf society. With the aid and sacrifice of the worgen Eadrik, Jarod Shadowsong, Maiev's brother, while trying to uncover the truth of what was truly transpiring, manages to survive Maiev's assassins, and after locating and freeing Malfurion, the two confront her and her Watchers, with Maiev fleeing from the scene after an intense struggle between the siblings and Malfurion eventually releasing Mordent and the other surviving Highborne. With the night elves keeping the [Divine Bell] to Darnassus for safekeeping and study, several Highborne mages portal themselves to Lion's Landing in Pandaria, asking for reinforcements from the Alliance and reporting a stealth attack on the night elven capital. Magister Xintar, a mage specializing in portal magic, accompanied Lorekeeper Vaeldrin and his daughter throughout Krasarang Wilds as they sought something which they believed might restore the kaldorei's immortality, only to have his powers sundered by a mogu trap, and later decides to visit the Timeless Isle as well as joining other night elves in the defense of the Shrine of Seven Stars. During the Burning Legion's third invasion, Prince Farondis led the Court of Farondis, some of its members being the Highborne. While the Shen'dralar as a whole did not seem to actively participate in the Broken Isles despite its ties to their ancient civilization, at least one of them, Tarelvir, left Darnassus to join the reformed Tirisgarde in the Hall of the Guardian alongside the greatest magi of all of Azeroth's different races, and the group seemed to have maintained their ties with the Kirin Tor. A female night elf, Archmage Nielthende, affiliated with the Kirin Tor, expressed interest in ley energy strewn throughout the region and asked adventurers from either faction to hop on a mana saber to absorb any lingering energy present, while two other night elf magi, Kallistia Starlance and Olothil Starlance, went to Azsuna from Dalaran in a reconnaissance mission seeking the spirits of their long-deceased parents. Tarelvir seemed to have returned to Darnassus after the defeat of the Burning Legion, rejoining Dyrhara and Maelir next to the Temple of the Moon, where the three warmly greeted the dwarven guests of Darnassus and where Dyrhara transported the three surviving members of the Explorer's League expedition to Stormwind with messages from Malfurion to Tyrande and Anduin. It is mentioned that the Highborne's presence in night elven society has allowed the kaldorei to expedite travel for small groups, sparing them lengthy sea voyages, as well as quickly conveying information to allies in potential times of war. After learning of the Horde's invasion of Ashenvale under Sylvanas Windrunner's command, Malfurion authorized some of the Highborne magi, including Sarvonis and Ralara, to assist Commander Delaryn Summermoon in fending off the assault. The Highborne were immediately met with unexpected cheers from their brethren, and they quickly transported more reinforcements, in the form of a dozen druids, to their aid as well. The Highborne magi on Delaryn's command burned all the bridges over the Falfarren River in an effort to slow the enemy advance, and were said to have helped immeasurably in the early stages, destroying many of the Horde siege engines. They were then targeted and killed by Sylvanas and her dark rangers, preventing them from helping the night elf defenders melt the frozen river later in the conflict. A single Darnassian mage was later seen accompanying Delaryn in the Twilight Vale. Inside the Temple, around the same time, Maelir helped transport Mia Greymane from Stormwind to Darnassus, telling the Gilnean queen that it was his honor to assist with the evacuation of her remaining people from the Howling Oak, which was successfully completed within several hours. The Highborne and Stormwind's magi managed to evacuate hundreds of worgen and night elven civilians from the capital as the war overtook all of Ashenvale and reached Darkshore, despite being unable to transport many more in time. As Teldrassil was being burned by the Horde, Tarelvir could be seen caught in the chaos of the devastation, but could be saved by adventurers, while Maelir and Dyrhara were seen together maintaining one of the last portals to Stormwind moments before the World Tree's destruction, through which Genn Greymane emerged to rescue his wife and an orphaned kaldorei baby. While many of the Highborne were presumably killed on Teldrassil, several night elf magi later joined the Battle for Lordaeron in retaliation for the Horde's attack. Following the Burning of Teldrassil, the Alliance and Horde both took an interest in the Blackfathom Deeps and fought against each other there, with the Alliance ranks including Mordent Evenshade. The nightborne of Suramar are the former Highborne who splintered off from the reign of Queen Azshara during the War of the Ancients and eventually from the rest of the world as well by erecting a dome around Suramar City. Led by Elisande, the Highborne of Suramar were transformed into the nightborne by the arcane power of the Nightwell. They rejoined the world during the third invasion of the Burning Legion where the kingdom joined the demons and closed the dome. This alliance resulted in a rebellion that ended the reign of Elisande and severed the shaldorei's ties to the Legion. Now, the nightborne, led by Thalyssra, who chafed at Tyrande's mistrust and suspicion towards her long-secluded people despite their shared ancestry, joined the Horde. Starlight Beacons were used by the Highborne star-augurs to focus immense amounts of starlight into a small, concentrated area. The device was mainly used during festivals, star-worship rituals, or when the augur needed to reach something on a high shelf. Their tapestries woven before the time of Queen Azshara's pact with the demons typically display a unique "under-over-over" style of needlework that has not been seen since. The noblemen used letter openers for killing. The ruling princes and princesses in Suramar chose only to wear their crowns at the most formal events. They were kept locked up at all other times, and were considered unstylish. Quietwine was an ancient Highborne term that simply meant "poison". The Highborne's penchant for all things purple predates the War of the Ancients. At some point the Highborne collection was fashionable. Many Highborne superstituously carried bits of leystone as a lucky charm. Such charms were typically worn by rural farmers, struggling academy students, or those sitting on the cusp between commonfolk and nobility. They use Scrying Stones to communicate from long distances. Some historians claim that the mistsaber's misty grey coat is the result of ancient Highborne experiments conducted on nightsabers. The Highborne maintained several academies of magic, like the Nar'thalas Academy and the Mennar Academy. The Thalassian word "quel'dorei" is now typically used to refer to the high elves. The term "high-born" has been used for centuries in real life to indicate those of noble birth. The [Highborne Pyxis] is a common Night Elf Archaeology item, while the [Highborne Soul Mirror], a rare Night Elf Archaeology item, creates a partially transparent mirror image of the player, one that continually turns to remain facing the character until it eventually fades. While not universal, many Highborne NPCs are of fair skin, with white hair and no tattoos on their face. Although a Scourge, Revanchion could have originally been a Highborne. Lord Talendar, Mistresses of Shadows, and Maidens of Shadows may have been Highborne night elves. Magistrates Temple could have been a Highborne building. The Highborne transforming into naga in The Frozen Throne. Symbol of the Highborne during the reign of Queen Azshara. ^  Return of the Highborne? This page was last edited on 16 February 2019, at 12:11.